The Swiss franc is defying predictions to weaken and traders are betting the rally will keep going. The franc is holding near the strongest level since 2017 against the euro and wagers on further gains in the options market have climbed to the highest this year. Concerns about the health of the global economy, Brexit turbulence and trade tensions are driving demand for havens such as the franc and Treasuries. The franc has gained by about 5 percent in the past year against the euro, which has been pressured by the European Central Bank’s dovish shift. This is despite the Swiss National Bank’s deposit rate being the lowest of any major central bank and the overhanging threat that it could intervene to stem an unwanted appreciation in the franc at any time. The rally has taken it to around 1.11 per euro, a level that has seen the currency reverse course and weaken twice in the past six months. This time demand for franc calls is rising, according to risk reversals, a gauge of market positioning. Options also suggest that the chance of euro-franc falling around 2 percent to trade below 1.10 in April has doubled compared to a month ago. That is a long way from the 1.21 level the franc was expected to weaken to by the end of 2019 in a Bloomberg survey of analysts a year ago. The consensus has now moved to factor in the franc’s persistent strength, but still sees it weakening to 1.14 this quarter and 1.15 at year-end. Any franc advance beyond 1.12 per euro has often been seen by analysts as unsustainable because of the risk of SNB intervention, with Credit Agricole AG last week recommending investors start selling it. Since then the franc has continued to climb, and the central bank’s Alternate Governing Board Member Martin Schlegel said on Monday that there was still room for easing monetary policy. That signals a struggle to curb the franc’s advance. 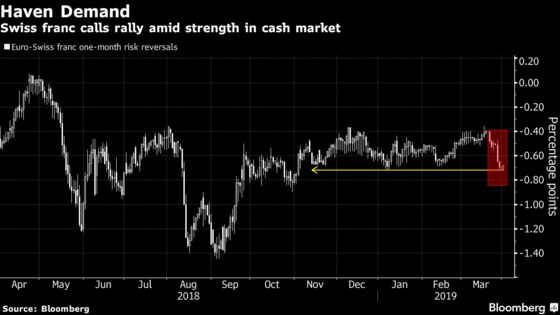 “The SNB can cut deeper, if they are really forced to,” said Steno Larsen, adding currency interventions could still start if the euro-franc pair slipped below 1.10, and then might escalate around the 1.0750 level.